Healthcare reforms are in place for now, but the future will likely bring continued challenges. The 2012 elections marked major movement in the struggle for universal healthcare coverage in the United States. Barack Obama’s reelection as president and the return of a Democratic Senate ensured that the Affordable Care Act (ACA), or Obamacare as it’s colloquially known, will survive through 2014, when much of the healthcare reform it contains will be implemented. This legislation is not perfect. Many social workers supported a single-payer system or, at minimum, adding a public option to the ACA. Despite this, the legislation provides a critical framework for addressing our nation’s healthcare issues. As the NASW put it, in response to the House of Representatives’ version being passed, the ACA is “a monumental legislative achievement of our time” and “a significant step toward a comprehensive and universal healthcare system for our nation” (Gorin, 2010). The Congressional Budget Office (CBO) estimated that, as a result of the ACA, around 95% of the legal nonelderly population in 2021 will have coverage vs. 82% without the legislation. The ACA’s fundamentals are simple: Beginning in 2014, everyone will be required to obtain healthcare coverage, and insurers will no longer be able to exclude individuals due to preexisting conditions or increase premiums because of health status or gender. Individuals without coverage will be subject to a fine of 1% of income or $95, whichever is higher, growing to either 2.5% or $695 in 2016. It is estimated that 3.9 million people will owe the penalty in 2016. The ACA primarily will expand healthcare coverage in two ways. The first is through health exchanges, which go into effect in 2014. Exchanges are marketplaces where individuals and small businesses (up to 100 employees) will be able to compare and purchase a range of insurance plans. States will either create their own exchanges or the federal government will step in to create exchanges for them. Insurers operating in the exchanges will be required to offer four different plans, each reflecting a different level of actuarial value, or degree of responsibility assumed by the insurer. According to a brief prepared by the Kaiser Family Foundation, under the lowest, or bronze, level plans, in most cases insurers would assume 60% of individuals’ medical costs. At the highest, or platinum, level, insurers will assume responsibility for 90% of consumers’ costs. Plans at all levels will be required to include a package of essential health benefits, according to the U.S. Department of Health and Human Services. Uninsured individuals with household incomes up to 400% of the poverty line will be eligible for subsidies to assist them in buying coverage. A second vehicle for expanding coverage is Medicaid. As originally written, the ACA required states to extend Medicaid coverage to individuals at up to 138% of the poverty line. This was expected to extend coverage to an additional 17 million people. However, in June 2012, the Supreme Court found this requirement unconstitutional on the grounds that it imposed an unfair burden on states. Although the federal government will cover most of the costs of the Medicaid expansion, the court left it to the states to determine whether they will participate. Several states have either not decided or said they will not participate in the expansion. This could have a particularly adverse impact on individuals who earn below 100% of the poverty line. The reason is that in some states only a “working family” can receive Medicaid, but the family’s income must be below 63% of the poverty line, and the ACA will subsidize only individuals earning between 100% and 400% of poverty (Madrick, 2012). As a result of the court’s decision, the CBO estimated that in 2022, 3 million fewer people will have coverage than previously estimated. There is a third, less publicized strategy for expanding coverage: States can create their own basic health programs. This “public health insurance” would be available to individuals who earn too much to qualify for Medicaid but have incomes below 200% of poverty (Cassidy, 2012). There is concern that these programs could threaten the viability of a state’s health exchanges. The ACA expands coverage under Medicare by adding free preventive care benefits, including mammograms and annual wellness visits. It also begins closing the notorious Medicare Part D “doughnut hole,” or coverage gap. In 2010 and 2011, Medicare beneficiaries began receiving rebates and discounts on brand-name and generic drugs. The doughnut hole ultimately will close in 2020. As a result of these changes, between 2010 and 2022, an average beneficiary enrolled in traditional Medicare will save $5,000. The ACA also extends the life of the Part A Hospital Insurance Fund by eight years, from 2016 to 2024. The critical issue of cost often has undone efforts for healthcare reform, namely how do we pay for it? Critics of the ACA argue that it is a massive, expensive, unworkable program that, particularly in light of the budget deficit, is something the United States can’t afford. However, as Jonathan Gruber, architect of the Massachusetts health reform plan enacted under then Gov. Mitt Romney and a key advisor to the Obama administration for the ACA, pointed out in Health Care Reform, the legislation is unique in that it not only provides benefits to millions of citizens but also reduces costs and the deficit. How does it do this? To start, the ACA reduces payments to Medicare Advantage plans. Medicare Advantage, or Medicare Part C, was created in 2003 as part of the Medicare Modernization Act with the hope of expanding the number of beneficiaries participating in private plans, which some believe are more efficient and cost-effective than traditional, fee-for-service Medicare. To strengthen these plans and prepare them for competition with traditional Medicare, the government paid them more than it pays traditional Medicare, a practice criticized by MedPAC, the independent agency created to advise Congress on Medicare. The ACA ends these overpayments. In addition, the ACA reduces reimbursements to hospitals and other providers, though not physicians. During the 2012 presidential campaign, critics of Obamacare argued that these changes would undermine Medicare, threaten the healthcare of older adults, and make it more difficult for Medicare beneficiaries to find physicians. However, as Gruber noted in his book, experience shows that paying hospitals less does not adversely impact patient care or outcomes but rather forces them to cut waste and increase productivity. There also is little evidence that most beneficiaries can’t find physicians, though this may be the case in certain geographical areas. In fact, Medicare patients have an easier time obtaining access than individuals aged 50 to 64 with private coverage. Other sources of revenue for the ACA include fees from pharmaceutical companies, insurers, and others who will benefit from the decline in the uninsured population and increased taxes on individuals making more than $200,000. According to the CBO, between 2013 and 2022, repealing the ACA, as some have advocated, will actually increase the deficit by $109 billion. The ACA also includes several mechanisms aimed at slowing the long-term growth of healthcare inflation. One of these is the Independent Payment Advisory Board (IPAB), an independent board of 15 physicians and health experts appointed by the president and approved by the Senate. The IPAB will make recommendations to Congress about how to reduce Medicare costs if they exceed a specified level. Congress will have the option of approving or rejecting these proposals. If Congress fails to act, the proposals will go into effect. The board cannot include anything that rations care or shifts costs to beneficiaries. A second mechanism for slowing healthcare inflation is the independent Patient-Centered Outcomes Research Institute, which will develop a research agenda for determining which healthcare treatments work better than others and disseminate this information broadly to practitioners and the public. According to Gruber’s book, the point is not to limit treatment or care—in fact, the law specifically prevents this—but to begin developing a national dialogue and consensus about what works and what doesn’t. The bill also begins taking steps to replace the current, largely fee-for-service healthcare system—which many believe promotes overuse and wasteful care—with a system of coordinated care, “where doctors don’t have an incentive to just dump you in the hospital when you are sick,” Gruber noted. The ACA encourages providers of Medicare services to establish “a new type of health care entity,” an affordable care organization, in which providers “agree to be held accountable for improving the health and experience of care for individuals and improving the health of populations while reducing the rate of growth in health care spending,” according to the Centers for Medicare & Medicaid Services. These measures may not prove successful. Evidence indicates that in many communities, providers now have the ability to dictate terms to insurers. Addressing this may require further government regulation, perhaps in the form of an all-payer system. Looking to the future, contention over the ACA seems likely to continue. Seventeen states have refused to set up their own exchanges, and more have not yet decided. Several have remained noncommittal or opposed expanding Medicaid coverage. In addition, in November 2012, the Supreme Court ordered a lower court to reopen a previous challenge to the ACA and evaluate it in light of the high court’s June 2012 decision to affirm the ACA’s constitutionality. While this may not pose a serious threat to the legislation, it does illustrate the depth of opposition to it and the determination of opponents to prevent it from being implemented. Perhaps the greatest threat to the future of the ACA is the current debate over the budget deficit. House Speaker John Boehner has insisted that repeal of the ACA must “stay on the table” in discussions over the country’s “massive debt challenge.” As part of a potential “fiscal deal,” the Obama administration could agree to extend the deadline for states to create health exchanges and reduce subsidies to individuals with earnings “below 250 percent of poverty rather than the current 400 percent” (Antos, 2012). It also could reduce the federal share of funding for Medicaid expansion. Much of the debate over the deficit revolves around the future of Medicare. Medicare expenditures are expected to increase from 3.7% of the 2011 gross domestic product to 6% in 2040. This increase is concerning, but it is important to examine it in context. Medicare costs have grown rapidly, but those in the private sector have grown even more quickly. Between 1997 and 2010, Medicare spending per enrollee grew at an average rate of 4.1%, while per capita premium growth in the private health industry grew at an average rate of 6.4% (Goldberg & Zainulbhai, 2012). To the extent that Medicare has a cost-control issue, it reflects the general problem of healthcare inflation. To bring the U.S. deficit under control, private healthcare costs must be addressed. It is also important to keep in mind that most Medicare beneficiaries are not affluent. According to the Kaiser Family Foundation, in 2010, one-half of beneficiaries had incomes under $22,000 and less than $2,100 in retirement accounts. One-half also had under $60,000 in home equity. In short, most beneficiaries don’t have significant funds available. Despite this, many political figures have advocated cutting Medicare as a means of controlling the deficit. Rep. Paul Ryan of Wisconsin, the 2012 Republican candidate for vice president, advocated a controversial proposal to turn Medicare into a system in which older adults would receive a premium support, or voucher, to buy private healthcare coverage or traditional Medicare. Because the value of the voucher would grow more slowly than the cost of healthcare, costs would gradually be shifted to beneficiaries. Ryan and others also have proposed increasing the retirement age for Medicare from 65 to 67. Although Romney and Ryan were defeated in 2012, these proposals likely will surface again. Social workers have long supported healthcare reform and have a stake in defending the ACA. Many clients, and perhaps many social workers, are likely to be among the 32 million people who will gain coverage thanks to the bill. The NASW has pointed out that the ACA “includes many provisions that will directly benefit the social work profession, including key elements from the Social Work Reinvestment Act” (Gorin). How can we defend the ACA from efforts to undermine it? Social workers in states that have failed to create exchanges or extend Medicaid to 133% of the poverty line can lobby their governors and legislators to do so. We also can oppose efforts to turn Medicaid into a block grant or Medicare into a premium support program. We can speak out against proposals to increase Medicare’s retirement age and oppose efforts to reduce subsidies that will enable low-income individuals to buy health insurance or water down the essential benefits plans must offer. Another issue to help address is the public’s lack of understanding of the ACA. Kliff (2012) noted that “a growing body of research suggests that most low-income Americans who will become eligible for subsidized insurance have no idea what’s coming.” In response, a broad coalition, including AARP, the American Academy of Pediatrics, the American Nurses Association, CVS Caremark, the National Association for the Advancement of Colored Persons, and the Service Employees International Union, has organized under the name Enroll America to make a “coordinated, concerted, and wide-reaching effort to ensure that Americans know how and where to sign up for coverage.” In November 2012, the NASW released a fact sheet aimed at educating the public about the benefits of the ACA. Social workers can play a critical role in helping make our clients aware of the benefits available to them. 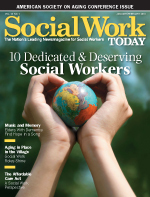 Social workers face a unique challenge and opportunity. After more than a century of struggle, Congress finally has enacted legislation that puts the United States on the road to universal healthcare coverage, though the law faces strong opposition. As advocates for clients and a more just society, social workers should do everything we can to defend the ACA and push the effort for universal coverage forward. — Stephen Gorin, PhD, MSW, is a professor in the social work department at Plymouth State University in New Hampshire. He also serves as part-time executive director of the state’s NASW chapter and editor-in-chief of Health & Social Work. Antos, J. (2012). After the fall (off the fiscal cliff). Retrieved November 30, 2012, from http://healthaffairs.org/blog/2012/11/15/after-the-fall-off-the-fiscal-cliff. Cassidy, A. (2012). Basic health program. Retrieved November 28, 2012 from http://www.healthaffairs.org/healthpolicybriefs/brief.php?brief_id=80. Gorin, S. H. (2010). The Patient Protection and Affordable Care Act, cost control, and the battle for health care reform. Health & Social Work, 35(3), 163-166. Kliff, S. (2012). Millions will qualify for new options under the health care law. Most have no idea. Retrieved November 30, 2012, from http://www.washingtonpost.com/blogs/wonkblog/wp/2012/11/21/millions-will-qualify-for-new-options-under-the-health-care-law-the-vast-majority-have-no-idea/?hpid=z2. Madrick, J. (2012). The Republicans’ Medicaid cruelty. Retrieved November 28, 2012, from http://www.nybooks.com/blogs/nyrblog/2012/jul/30/medicaid-cruelty.